Over the years, Quilters’ Choice, now know as The Inspired Sewist, has seen lots of changes. We’ve moved from one location to another, terrific staff members have come and gone, we were bought and sold, and we even changed our name. 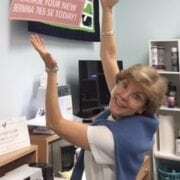 One thing that has stayed with us throughout all those changes is our wonderful store manager, Nan. Nan started with Quilters’ Choice in 1992. Nan says “that was such an exciting time! 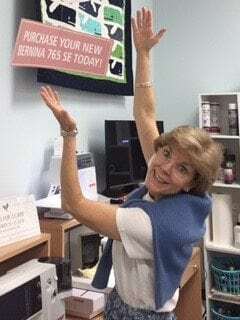 I was there when we first became a Bernina dealer. The top of the line Bernina then was a model 1530. We were so amazed by all that machine could do, and by the way a quality sewing machine could make the sewing experience for our customers so much more rewarding.” Nan quickly became an expert on the first machines, and, as Bernina made tremendous technological strides, Nan continued to master the newest machines, technology and software. We at the Inspired Sewist know that, without Nan’s expertise, friendship and guidance, our store wouldn’t be the terrific sewing center we are today. Be sure to tell her thanks the next time you come in!